Homepage photo: Rocky Waters Vineyard in Hanover, Illinois, along the Mississippi River. The view from Danzinger Vineyards in Wisconsin with the Mississippi River in the background. Since long before human settlement, wild grapes grew in abundance along the Mississippi River. 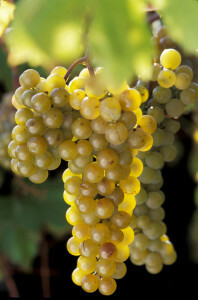 The grape species known as Vitus Riparia- which translates to “River Grape”- is one of the most common grapes of the Upper Mississippi region. Today, there are no fewer than 29 wineries along the Mississippi River from the Twin Cities down to Quincy. However, the wine grapes being grown along the River today are very different than the wild grapes that Lewis and Clark encountered. Plant scientists at the University of Minnesota and elsewhere have created new hybrid wine grapes by breeding native grapes, like Riparia, with some of the better-known wine grapes from Europe. These new ‘cold hardy” wine grapes combine the cold tolerance and disease resistance of native grapes with the flavor and aroma characteristics of traditional varieties. Many of the new cold hardy wine grapes are named after towns along the Mississippi River. Examples include La Crescent, Marquette, and Frontenac, all grapes developed by the University of Minnesota and named after Mississippi River hamlets. 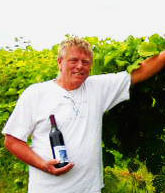 John Marshall is a grape grower and winery owner in Lake City Minnesota. His Great River Vineyard is less than a mile from Lake Pepin, which is the largest natural lake in the Mississippi River. Dorothy O’Brien owns Wide River Winery, with tasting rooms in Clinton, and Le Claire, Iowa. Wide River takes its name from the Mississippi River; which is two and one half miles wide beside the Winery’s eight-acre vineyard. O’Brien says the proximity to the River makes her vineyard site ideal. The wide spot in the river creates a reservoir of warm water that reduces frost occurrences and extends the growing season. At Wide River’s vineyard the river also carved out a bluff. The vineyard is on top of the bluff, 250 feet above the water. Cold air is heavier than warm air, so it sinks to the lowest spot and away from the grape vines. This summer, O’Brien opened a new tasting room in Le Claire, 18 miles downstream from the main location. She says many of her customers enjoy the drive down the Great River Road (US Hwy 67) between La Claire and Clinton and visit both wineries in one day. Two hundred miles up River from Wide River Winery is Seven Hawks Vineyards, the largest vineyard in Wisconsin. Various soil compositions along the River result in differences in wine character. The soil in Wide River’s Iowa vineyard is mainly loam; a mix of sand, gravel and topsoil deposited by the River thousands of years ago. This loamy soil drains well, which is tailor-made for growing wine grapes. In contrast, the soil at Seven Hawks contains more limestone with shallow organic topsoil. 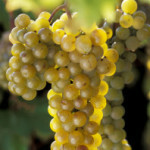 Grape vines pick up the calcium carbonate from the soil and this ‘minerality” can be tasted, particularly in white wines. ‘Because of the soil, our wines have some similarities to French Chablis,” Nilles said. Seven Hawks also has five rental cottages on a steep, wooded hillside overlooking the River. The cottages pre-date the vineyard by six years. Nilles, who worked in construction before starting the winery, said his goal was to build the cottages without damaging any of the large trees in the area. Guests in the cottages are treated to free wine from Seven Hawks. 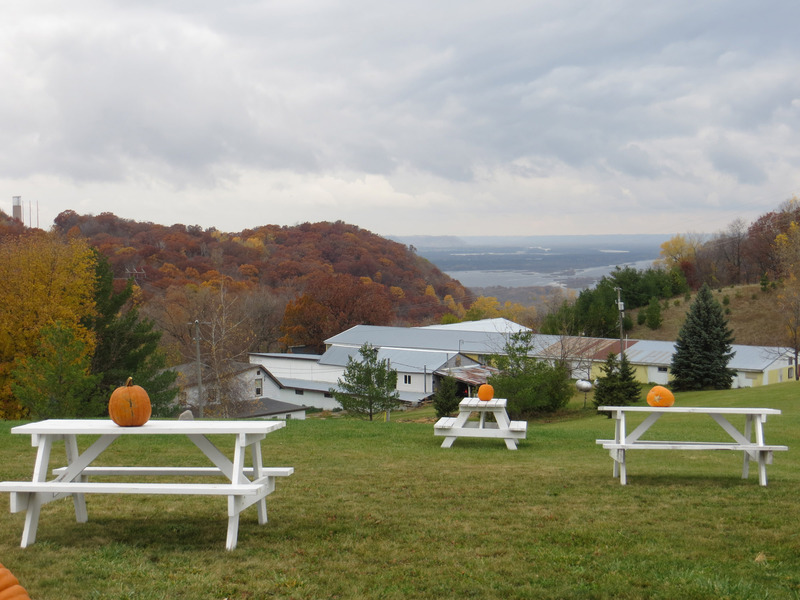 Midweek cottage guests at Seven Hawks also receive free tastings at three other top local wineries; Danzinger Vineyards in Alma Wisconsin, Elmaro Vineyards in Trempealeau, WI and Garvin Heights Winery in Winona, MN. To help tourists navigate the wineries along the River, the Great River Road Wine Trail has nine member wineries stretching over 200 miles from south of St. Paul to Marquette, IA. Marquette, home of Eagle’s Landing Winery, is one of the most popular tourist towns on the Great River Road Wine Trail. Eagle’s Landing is on bustling North Street, along with many shops, bars and restaurants. On summer and fall weekends, a band is usually playing on the patio and a room full of wine drinkers fills the tasting room. La Crescent– According to Katie Cook, enology project leader at the University of Minnesota, this wine is reminiscent of an aromatic white wine from Germany or Austria, like Riesling or GewÃ¼rztraminer. Marquette– A red wine that has both native Riparia grapes and Pinot Noir as its parents. It makes a rich, red wine with notes of cherries and black pepper. Frontenac– Frontenac is capable of withstanding temperatures of -33F. It has bright acidity and is often made into outstanding Rose and Port style wines. St. Pepin– This white wine is usually sweet with apple and pear aromas and flavors. Brianna– Produces white wines with powerful tropical fruit tones of pineapple and banana. This article appeared in the Fall 2013 edition of “Our Mississippi” magazine and is reprinted with permission. To see “Our Mississippi” visit US Army Corps or Engineers Mississippi Valley Division. Iowa Tourism Running Wine Ads in Chicago, KC and Mnpls. the opportunity to share this beautiful area and what we have to offer. Thanks for you kind words Michael. 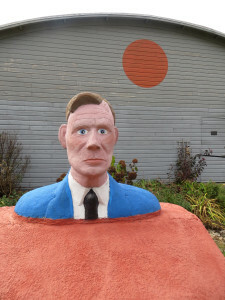 I enjoy telling your story and supporting the Midwest wine industry. The Driftless Area is one of the most beautiful places in our country.